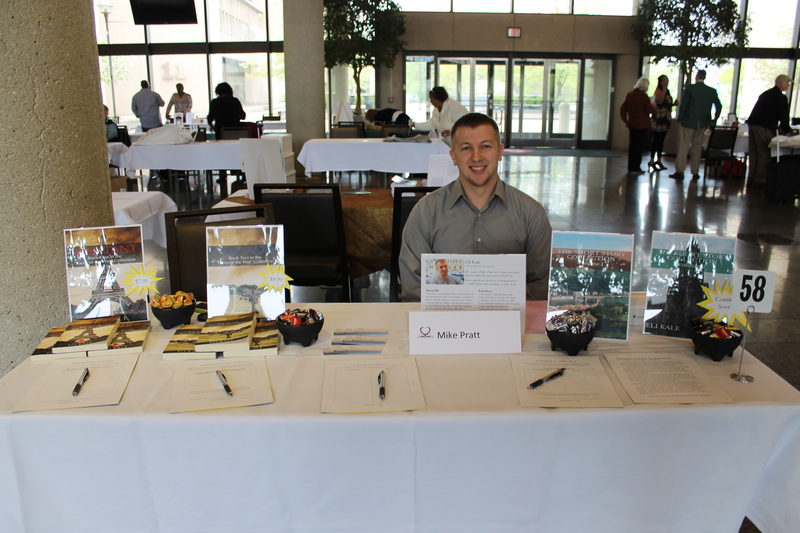 This past weekend, I attended the Dayton Book Expo at the David H. Ponitz Conference Center at Sinclair Community College. 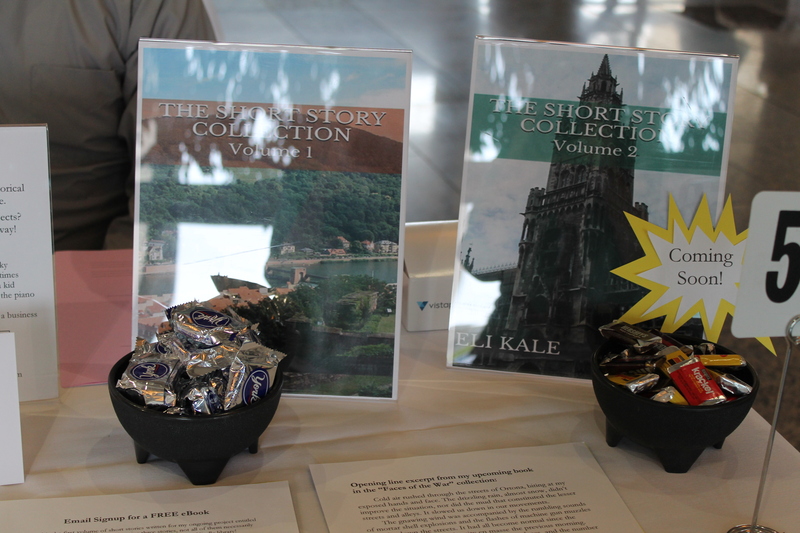 There were over 90 other authors, some of which were sponsored by the Dayton Metro Library. Prizes and awards were handed out throughout the day, and there was an award at the end given to the author with the highest sales that day. It was populated by many readers, some local and some from out of town. Overall, it was a good experience! 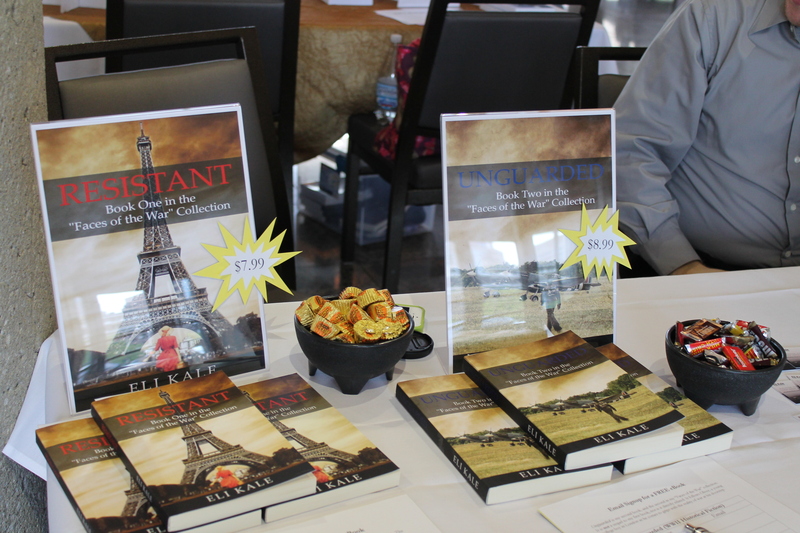 Though I can’t put a number on it, I had many people – readers and authors – visit my table. It was great to chat with others about my writing story, my work, and what I’m planning for the future. Most of the slots on the free ebook signup sheets were filled, and many people wanted to be added to my mailing list. If you haven’t done that yourself, you can easily join the group here. In terms of books sold, that number was 3. Bright side: both of my books will be in a library in Michigan, available to be read by countless high school students. I also gave away many business cards, so hopefully I’ll be contacted in the near future for networking and/or collaboration. It’s a start, at least, and that’s how you’ve gotta make your way sometimes. Plans have already been started for next year’s expo, but I’ll wait until closer to then before deciding on returning. I’d like to attend other expos to see what else is out there; I simply treated Dayton as a test expo to get the basic gist of things. We’ll just have to see what time brings! 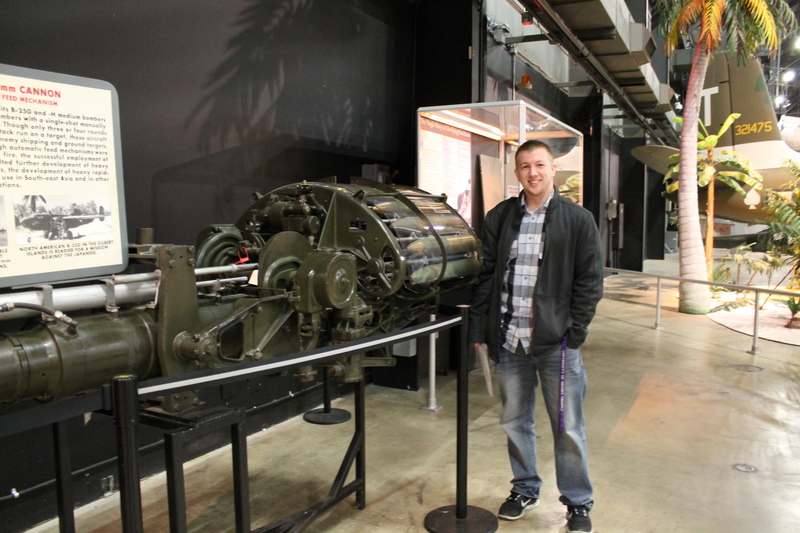 On Sunday, my wife and I visited the Air Force museum in Dayton, and let me tell you – it was great! It’s crazy to think that all of the planes there had seen action in wartime, and it’s even crazier that they survived to be showcased as pieces of history. And what made it even more special for me was that I got to see many planes from the World War II era, which greatly interests me. I am so glad I got to visit the museum and see these pieces of history, and know that they were used to bring the war to an end. More pictures will make their way onto my social media and website over the coming weeks and months, but I think this will do for now. In addition to these pictures, I’ll have footage of my visit in this week’s vlog, so subscribe to my YouTube channel to catch that video! Progress is being made on this front, with the total word count approaching the 15K word mark. I plan to tackle more writing this week in great amounts, so my hope is that I’ll exceed the 20K by the beginning of next week. Work will soon begin on the book cover, I hope, so I will let you know of those details when the time comes. Progress has slowed a bit on this project, but I still am shooting for a summer release. Keep an eye out for details about Volume 2 as the summer months approach. And if you haven’t checked out Volume 1 yet, you can find it here. As for other news, I am still keeping up with my YouTube vlogs, with the next video going live this Friday. I’m also keeping the GoFundMe campaign open to receive donations for the National WWII Museum in New Orleans. As for personal things, I am on the lookout for a new, full-time job. I’m hoping these next couple of months will bring some change in my life, and that I’ll be able to accomplish the writing that I want to get done. As always, thank you for your encouragement and support. I truly appreciate it! Dayton Book Expo is Close! I am happy to say that writing for Part I is nearing its completion…only a few thousand more words to go! Though writing has been slow due to preparations for the Expo this coming weekend, I look forward to picking up the pace upon my return next week. Also on this front: ideas for the book cover are coming together and I’ll soon be getting things moving for that, so keep an eye out for details in the coming weeks and months for its reveal! During the writing of this book, I have come to realize that I have a better understanding of creative writing, and my hope is that this trend will only continue so I can produce better writing. The storyline of this book is different from my previous two books in many ways, yet my aim is to intertwine familiar plot and structure attributes into it. I am excited for what this story will convey to readers and how the moral of it will be perceived. Time will tell! Not much has happened on this project, given that my main focus has been preparing for the Expo and writing in my third WWII book. I am still awaiting the return of a manuscript from a beta reader, so the project as a whole won’t be moving forward anyway. As I said before, my hope is to now have this project released by early summer, so keep an eye out for details to come! With the Expo only days away, my excitement is ever increasing. I have just about everything ready to go for my table displays, which I hope will be sufficient. That’s all part of the process, I think–gauging what I should take with me and hoping it’ll be enough, and then comparing other tables when I get there. Then if I plan to go again in the future, I’ll have a better idea of what to do! The Expo will be from 11am to 4pm this Saturday, April 25 at Sinclair Community College. I’ll be in the Great Hall (Building 12), but I’m not yet sure where exactly I’ll be set up. But the details for that will be in the reader’s event booklet, so you can find me in there. At my table, I’ll have paperback copies of my two books, which I can sign if you’d like, as well as an email signup list to receive a FREE ebook of your choice after the Expo. And of course, if you’d like to chat about WWII or my books, I’d love to entertain a conversation! Remember: I’ll be in attendance under my real name (Mike Pratt) and will be listed accordingly; however, my table information and books will have my pen name on them (Eli Kale). I hope to see you there, and if not, then I’ll let you know how it went in next week’s blog post! My writing process videos are coming along well, with my ninth one in production this week. Last week’s vlog touched on the topic of having another person (friend, colleague, professional, etc.) edit your manuscript and the importance of it. This week’s vlog will touch on what to do once you get the edited manuscript back. To catch up on (or start watching) my vlogs, you can find them on my channel here. Please consider subscribing! I am raising money to support the National WWII Museum in New Orleans. If you have it in your heart to help me support this organization, and to help maintain an important part of history, then please consider donating to my campaign. You can find the details on my campaign page here. That’s about it for today, but more details and information will arrive in the coming weeks. Thank you for reading my posts, and for supporting and encouraging me as I pursue my passion. It truly means the world! Last week, I mentioned that I was on pace to complete my next short story ebook, Volume 2, by the end of the month. I really wanted to reach that goal so that I could focus on my next WWII book for a few months. However, upon receiving feedback from my beta reader, it is clear to me that I should spend some extra time on one story in particular. This means that I won’t be releasing a new ebook in the spring, at least not by May 1. But that’s okay – I’m excited to see how the stories develop and where they take me this time around. And who knows…maybe putting in a little more time than usual might make the stories really good. Time will tell! If you would like to check out my first short story ebook, Volume 1, you can find it here. Since the beginning of the month, writing has slowed a bit on Book Three. As is usually the case, life simply happens and thus pushes concentrated writing down the priority list, as well as decreases the amount of time in which to do it. However, I am convinced that the overall pace of this book is still very much on schedule for my intended release, but those details won’t be revealed yet for another few months. If you’re interested in checking out my first two books set during the Second World War, you can find them here: Resistant and Unguarded. Videos about my writing process are slowly making progress on my channel. I currently have seven videos posted on the topic, with eight more to go! If you haven’t yet checked them out, I encourage you to do so. And while you’re at it, be sure to click those “Subscribe” and “Thumbs Up” buttons. It’ll really help me out! The Expo is fast approaching, and I have most of my tabletop material together and ready. I am very excited to see how it goes and who I meet. This is a big step for me in my writing life, and I’m glad I have the opportunity to do it! Also, I plan on vlogging while I’m there, so keep an eye out for that video! I am raising funds via GoFundMe to support the National WWII Museum in New Orleans. I am doing this because I want to take part in maintaining history, especially that of a time period of which I am so attached and by which I am so intrigued. If you have it in your heart to donate in support of this campaign, I implore you to check out the campaign website and consider donating. Every little bit helps! Thank you all so much for your support and encouragement of my writing passion. Without you behind me, this would be a whole lot harder! I will resume writing on Book Three today, after this post goes live, and hope to get into another rhythm throughout the rest of this week. I am only about 5,000 words away from finishing Part I, so I’d really like to hit the writing hard this week to reach that mark. I am still very excited to see what this writing experience brings me and where this story will take me! In other Faces news, Resistant and Unguarded are selling consistently…slow, but consistently. I have been told that Unguarded is a much better book in terms of writing improvement, so I encourage you to check it out! You can find the Amazon sales page here. You can also find the sales page for Resistant here, if you’re interested. Speaking of my first two books, I will have hard copies (paperback format) available for sale at my Expo table. There will also be an email signup list for those interested in joining my mailing list, as well as for a FREE ebook copy of one of my books. There is a limited number of spaces to sign up, so once they’re filled, that’s it! So if you’re coming to the Expo on April 25th, be sure to stop by my table for a chance at a FREE book and to chat with me. I am currently in the process of awaiting feedback from beta readers on my upcoming release Volume 2. If all goes as planned, the ebook will release by the end of the month. However, sometimes things happen so it’s wise to take that into account. I will continue to update you with release details as the time nears. If you want to check out my first ebook, Volume 1, you can do so here. I am really looking forward to the initial donation to my campaign! 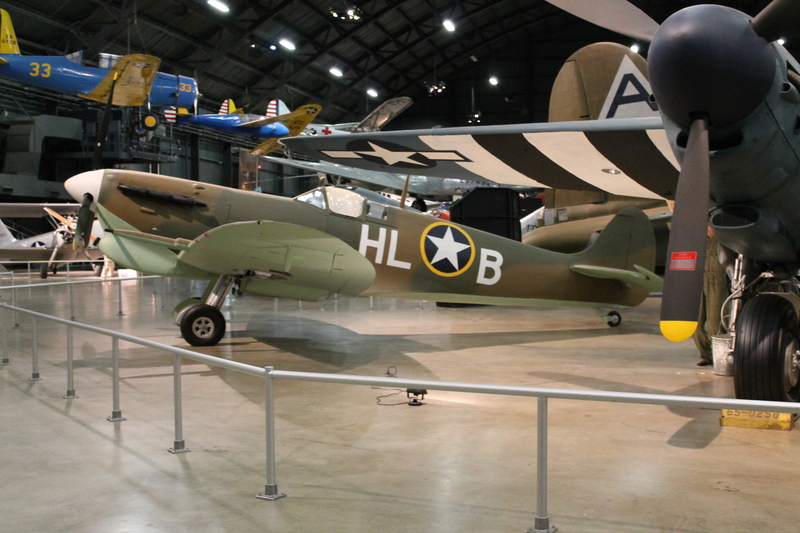 Money donated will support the National WWII Museum in New Orleans. I am looking to help make a difference in the world of history by helping to maintain a part of it, and your donations will help! So please, consider it and consider telling a friend about it. Every little bit helps! My videos are slowly but surely gaining more exposure in the YouTube world, and hopefully in the writing world as well! If you haven’t yet seen my videos, you can find all of them on my channel here. My most recent video on writing process can be found here. I will continue to produce these videos, because I have developed a passion for it and it also is something that I think can help expand my author platform. That’s about it for news on all fronts, but things are always changing and improving. So I will keep you in the loop! BUT – I can do that way better if you join my mailing list, where I divulge more details and reveal more information than here in the blog posts. So come on over!